About — DOGWOOD CANDLE CO.
Our candles are made from natural ingredients. Each scent is carefully selected and combined to create a unique and beautiful aromatic experience. . We repeatedly test our candles to ensure that they are of the finest quality, and that they provide optimum burn times. 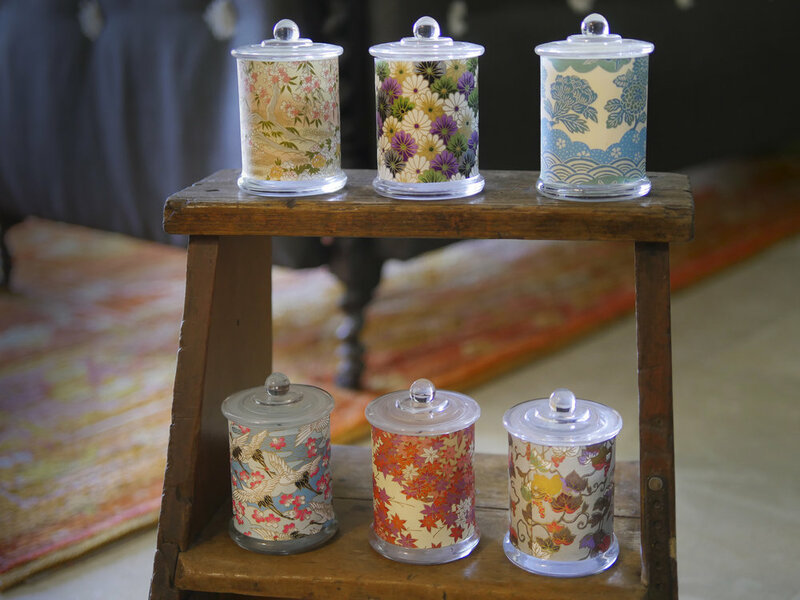 The candles are meticulously covered in handcrafted paper made in Japan. Each sheet of paper is screen printed by hand over forty times to create vibrant and exquisite patterns, specifically sourced to match our range of fragrances. The thick fibres used in Japanese Chiyogami paper makes it stronger than regular paper without added weight, thus allowing light to flow through the paper more easily, making our candles visually beautiful as well as aromatically beautiful. It is important to trim your wicks after each use to maintain optimum quality of our candles. The wick should be trimmed to length of 5mm to prevent smoking. As candles have a burn memory, when first lighting the candle ensure the was has melted across the entire surface to establish even burning throughout the life of your candle. Once our candles have been used you can then carefully wipe out the remaining wax with a damp, warm cloth and re-use the container as a tea light votive which will illuminate the delicate design of the paper. We hope that the design of our candles will encourage customers to recycle their jars, helping to contribute in keeping our planet clean and minimising pollution. We here at Dogwood Candle Co hope you enjoy burning our beautiful candles as much as we enjoy creating them. Custom Peony Rose candle burning.